Take a look at this beautiful 64' Sunseeker yacht for sale in Florida! 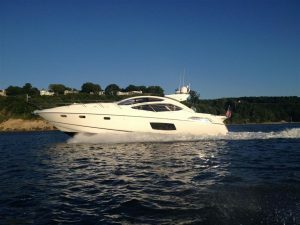 : Atlantic Yacht & Ship, Inc.
Take a look at this beautiful 64′ Sunseeker yacht for sale in Florida! Be sure to keep in mind that John Slate has a great deal on a beautiful 64′ Sunseeker yacht for sale in Fort Lauderdale, Florida! In the first place, if you are looking for the perfect Sunseeker, you have found her. In face, this yacht is hands down the lowest priced, best condition Sunseeker currently available. She is built with the latest Volvo Penta 1200 IPS drives which makes navigating and handling the vessel around the dock a breeze. Her IPS drive system also makes the vessel extremely quiet. Of course, this 64′ Sunseeker yacht has great performance and a great cruise. Furthermore, she has the desirable lighter interior with dark contemporary accents. Additionally, this 64′ Sunseeker yacht was built with nearly every factory option and also has the very sought after non colored hull. Her bottom was recently painted and prop speed applied in July. She is truly a complete package so do not miss this opportunity to own your perfect boat! For more information on this 64′ Sunseeker yacht be sure to contact John Slate today! After all, a quality used Sunseeker yacht like this will not be available for long! Check out this beautiful used 80′ Sunseeker yacht for sale in Florida!